Discount Solar Screens - Shade your windows from the Arizona Sun! South, and West facing windows. Both SRP and APS recognize that windows are the number-one source of heat gain in the summer, responsible for as much as 48% of the cooling costs of your home. 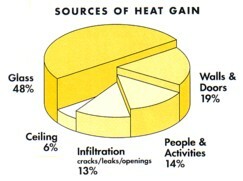 The most effective way of preventing this heat gain is by shading the sun before it heats the glass. Interior blinds, drapes, and window film all block the sun after they have penetrated and heated the window glass, so the heat is free to radiate into the home. Exterior solar screens can block up to 90% of the sun’s energy before it heats your windows, dramatically reducing the heat in your home and the load on your air conditioner. Highest Quality at Low Prices! The strongest, most durable, most effective solar screen on the market today is Phifer Suntex (see the product info page for more information). Mounted on a sturdy aluminum frame it is the highest quality window screen available today. Get this quality installed on your home for a price that is extremely fair and reasonable. If you live in the South-East Phoenix valley (Gilbert, Chandler, Mesa, etc.) and need solar screens I hope you will let me help you. My objective is to provide quality work every time, and to be an amazing value. Reduce your utility bills starting today! My name is Bryan, I personally handle every order and every installation (yes, I'm a one man operation). During the busiest months (spring to early summer) it is difficult to make a free quote appointment with everyone that calls, but I can answer most questions and quote prices through email. I do get to everyone that is ready to order, and others when I am in their area. Serving AZ cities of Gilbert, Chandler, Mesa etc. 3/3/11: Now follow on Facebook for current specials and info.